Kenny the Cat (Episode) – From SpongePedia, the biggest SpongeBob-wiki in the world! 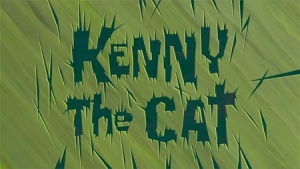 Kenny the Cat is an episode from Season 9. 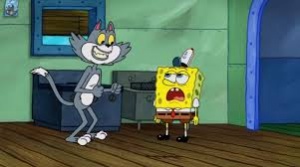 SpongeBob wants to meet his new hero Kenny the Cat, a cat who can hold his breath for an incredibly long amount of time. Sandy thinks this is illogical, as mammals can only hold their breath for three minutes before passing out. But when SpongeBob is coming to Bikini Bottom the next day, he and Patrick camp out over by the sidewalk Kenny will walk on. However, in the Krusty Krab bathroom, SpongeBob learns the truth about Kenny. It is possible this episode was made to compensate with the death of Mermaid Man's original voice actor, Ernest Borginine. First time it shows stars in a sky. When SpongeBob was in Sandy's treedome without a helmet he shriveled up like in House Sittin' for Sandy. This episode premiered in the US right before the Nickelodeon Kids Choice Awards 2014. This page was last modified on 22 May 2018, at 05:47.